Did you feel a sudden loss of Internet freedom in February 2015? That's when the Federal Communications Commission imposed net neutrality rules that prevent Internet service providers from discriminating against websites and other online services. And that's when Americans lost their Internet freedom—according to the current FCC chairman, Ajit Pai. Pai, a Republican and former Verizon lawyer, opposed the net neutrality rules when Democrats held the commission's majority, and he quickly got to work dismantling the rules after being appointed chair by President Donald Trump. To convince the public that the FCC should eliminate rules it passed two years ago, Pai's office yesterday issued a press release titled, "Restoring Internet freedom for all Americans." The press release says the plan to eliminate Obama-era Internet regulations "will benefit all Americans" by "boost[ing] competition and choice in the broadband marketplace" and "will restore Internet Freedom by ending government micromanagement and returning to the bipartisan regulatory framework that worked well for decades." The press release doesn't say which freedoms ordinary users of the Internet lost because of net neutrality rules. The rules didn't actually impose requirements on users of the Internet—or the website operators and other companies that provide services over the Internet. The rules were targeted only at ISPs such as cable, DSL, and fiber home Internet companies and cellular data carriers. Because of net neutrality rules, ISPs aren't allowed to block or throttle lawful Internet traffic and cannot accept payments in exchange for prioritizing some online services over others in the network path to customers' homes or mobile devices. The rules were implemented using the FCC's Title II authority over common carriers, and Pai intends to eliminate the FCC's classification of ISPs as common carriers. Along with net neutrality rules, Title II was also used to require greater disclosures about hidden fees and data caps and to force ISPs to get consumer consent before using or sharing Web browsing histories, two sets of rules that Republicans started chipping away at even before yesterday. 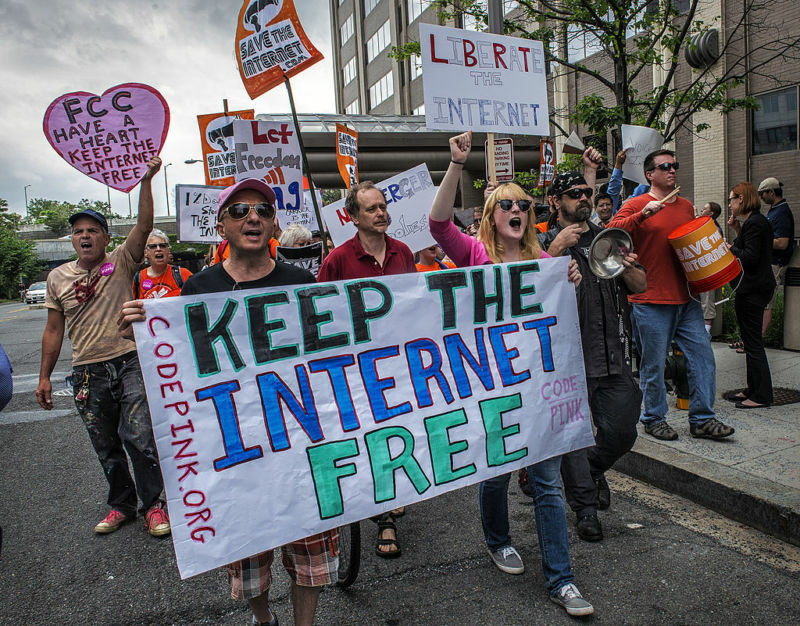 Title II has also been used to prevent slowdowns of Internet traffic caused by disputes over network interconnection fees, which was a problem for Netflix users before the net neutrality rules were implemented. More generally, the classification of ISPs as common carriers requires their rates and practices to be "just" and "reasonable" and lets their customers or companies that deliver services over the Internet complain to the FCC about unjust or unreasonable behavior. ISPs will clearly have more freedom if the Title II classification and net neutrality rules go away. Comcast, AT&T, Verizon, Charter, and lobby groups for ISPs praised Pai's announcement yesterday. But consumer advocacy groups and Web companies urged the FCC to preserve net neutrality rules, saying they are crucial for giving online businesses access to customers and for letting Internet customers use the applications and websites of their choice. Advocacy group Free Press published an updated list of incidents in which ISPs interfered with Internet content in the years before Title II net neutrality rules were implemented. Before implementing net neutrality rules in 2015, the FCC received 4 million public comments, mostly in favor of strict rules for ISPs. Yesterday, Pai dismissed Title II support as coming from "special interest" groups, particularly Free Press. Sir Tim Berners-Lee, who invented the World Wide Web in 1991, criticized Pai this week, saying, "the Internet must remain a permissionless space for creativity, innovation and free expression."